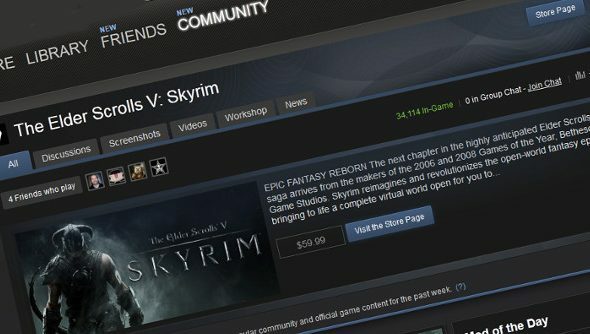 Valve are adding a Community Hub to each game’s page on Steam. The hubs will be a, well, hub for user screen shots, videos, and discussion. Think of it as a forum that doesn’t feel like a vestige leftover from 90s computing. And, there’s more announcements to come too. So, yes, this does mean that Valve announced another thing. They’re spoiling us for things at that moment, what with Green Light, the Steam Workshop, ARGs, andsoftware coming to Steam, Valve seem to be the most active they’ve ever been. Like an ancient war machine coming back tolife to take over the world but in a good way. This is also only the first of four new things to be announced this week. With a new feature/surprise/happy-fun-box being revealed each day until Thursday. There features will go through a beta period before being opened to the entire community. Though Valve are keeping shtum as to when that beta begins. This isuninformed speculation, and I don’t even have wizened years to back up my assertion, but, with the last announcement coming on Thursday, I’d putodds on the beta beginning this Friday. You can get a look at the new hubs and a giant ominous countershowing the combined number of user-created videos, screenshots, and Workshop items.